The world of gambling is currently undergoing a revolution as more and more luck chasers head to the internet to get their fix. As fantasy sports become more and more popular, cyber casinos have to compete even harder in order to keep up. From free slots all the way to meticulously branded machines, the dynamic is changing. As a result online slot machines, the bread and butter of digital gambling, have been upgrading at a pleasing rate. 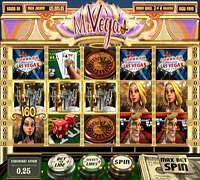 One of the more popular online slot machines around is a game by the name of “Mr. Vegas”. There are many reasons to fall in love with this online slot machine so let's take a look. “Mr. Vegas” seeks to bring the world of Las Vegas directly to the living room of gamblers all over the world. The game, once loaded, blasts your senses with information. Gamblers will be struck by the flashing lights in the title, the subtle animation of the different reels, and the vibrant colors used to flesh it all out. “Mr. Vegas” looks great, in summary, and merely interacting with the slot machine is a pleasure. The entire veneer over the machine reeks of technology and it is aesthetically pleasing. The game is a 3D free slots paradise that reeks of Vegas excess. In short, it is wonderful. Once the intrepid gambler has looked past the aesthetics of the game they will see that “Mr. Vegas” is very similar to other machines in the field. On the screen “Mr. Vegas” proudly displays its 5 reels while boasting the ability to utilize up to 30 total paylines. On the screen there are a few buttons to customize the gambling experience and they are cleverly hidden away as poker chips. Once the reels start spinning the aesthetics take a backseat. Gamblers are here to make a profit, not get lost in all of the techno jazz. “Mr. Vegas” operates like any other slot machine in that it offers unique pay outs and a special bonus round to entice gamblers to keep hitting that lever. The bonus round is a dice game that features “Mr. Vegas” himself. The game itself is fun with the major positivity coming from how random yet seemingly easy it is to hit a nice little pay out. If lucky, this bonus game will give the lever pusher a couple of free spins. One of the better features of “Mr. Vegas” is that it boasts a charmingly simple to read layout that allows gamblers to reach all of the information they may need as they continue to play. At the top corner of the interface is the “Payouts Layout” button. Here slot players will find exactly what they want to see on their screen. The Cleopatra-esque woman boasts the highest payout while the Ace/Jack pair of cards boasts the smallest. Underneath this information is a chart of the various ways to win in the game. To try out the game takes little more than some patience. “Mr. Vegas” can be utilized with free spin options in order to test out the waters. Otherwise, “Mr. Vegas” is a wonderful option for those looking to take advantage of the next wave of gambling. Enjoy.